Sorry... the 2017 Honda HR-V is no longer being sold as new. Instead, take the first step to a great deal on 2019 Honda HR-V with a free price quote! 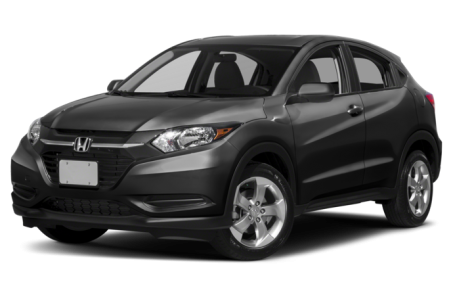 The 2017 Honda HR-V is a subcompact crossover that seats up to 5 passengers across 2 rows. Though smaller in dimension, the HR-V still offers plenty of usable passenger and cargo space, especially considering it shares a platform with the Honda Fit. There is 24.3 cubic feet of cargo space behind the second row, which expands to 58.8 cubic feet with the rear seats flipped down (this beats the Fit and its 16.6/52.7 cubic feet). It competes with the Mazda CX-3 and Fiat 500X. This year, it remains largely unchanged. Exterior styling is unique to the HR-V, it looks very distinct from both the Fit and CR-V. It takes on the traits of a modern crossover, more sleek than rugged with a low roofline, subtle rear spoiler, and plenty of sculpting down the sides to give them added definition. A large front grille leads the way, with aggressive inlets cut into the front bumper. 17-inch alloy wheels and LED brake lights come standard. Under the hood, the HR-V borrows its engine from the Civic compact car, a 138-hp, 1.8-liter 4-cylinder that is mated to a 6-speed manual or a CVT. Front-wheel drive is standard, with all-wheel drive optional. Fuel economy figures vary by transmission and drivetrain configuration, with the CVT and front-wheel drive being the most efficient setup offering an EPA-estimated 28/35 mpg city/highway. Inside, the HR-V gets the same second-row Magic Seats that are found in the Fit. The second row seats can either fold forward to open up a large rear cargo area, or the seat bottoms can fold up for the storage of taller items. The front passenger seat can also fold all the way forward to fit very long items as well. Standard features include Bluetooth connectivity, air conditioning, USB port, and steering wheel controls for the audio, cruise control, and Bluetooth systems. The EX and EX-L feature a 7-inch touchscreen for the audio system that swaps many of the physical controls on the center console for touch based ones. Both trim levels also feature heated front seats, automatic climate control, and Pandora internet radio via a connected smartphone. Also available are leather upholstery, navigation, HD radio, and an auto dimming rearview mirror. Standard safety features include six airbags, antilock brakes, electronic stability control, and a rearview camera, something Honda has said they would like to include on all of their vehicles going forward. The EX trim and above also add Honda’s LaneWatch system, which uses a camera mounted on the passenger’s side mirror to display a live view of the HR-V’s blind spot on the center touchscreen. As of this writing, the HR-V had not yet been submitted to crash testing by the IIHS or NHTSA. 114 of 120 (95%) consumers said they would recommend this vehicle to a friend.